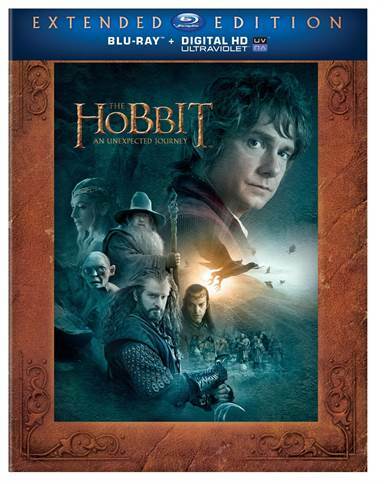 *Note: This review focuses on the extended version of the recently released Blu-ray of The Hobbit, all video/audio specs and special features focus on this release specifically. It was bound to disappoint. With expectations at an enormous high, a 48fps experiment in tow, and fandom, both literary and cinematic, frothing at the mouth, poised to strike the moment the first film in The Hobbit trilogy showed the slightest sign of weakness, it was bound to disappoint. And yet it shouldn't have. Criticism continues to run the gamut. Too long! Too slow! Too expansive! Like butter scraped over too much bread! Was anyone really that surprised to see Jackson and company indulge a little? Did the decision to stretch two films into three fail to clue anyone into the fact that An Unexpected Journey would be more akin to a Lord of the Rings extended version than a lean, mean theatrical cut? For that matter, are the same people who swear by The Lord of the Rings Extended Editions actually upset with the end result? By some strange, blinding magic: yes, yes and yes. Fortunately, it was only bound to disappoint some fans. There are those among us who chose a different path. Those who were familiar with the quaint, charming tale of "The Hobbit," enough so to avoid setting Rings-slaying expectations. Who didn't squander our first viewing of An Unexpected Journey by leaping headlong into an entirely new (and arguably distracting) way of watching a film. Who were overjoyed to immerse ourselves in Peter Jackson's Middle-Earth once again, for whatever length of time he saw fit. No, The Hobbit isn't perfect. It isn't a sacred adaptation of Tolkien's text, or even one that rivals any of The Lord of the Rings films. It's a gorgeous, gripping, at-times enthralling return to Middle-Earth, though, with far more to offer the Peter Jackson and J.R.R. Tolkien folds than many are willing or perhaps able to admit. The humble, altogether simple story of "The Hobbit" becomes the grand, still relatively simple story of The Hobbit, with a smart series of additions, refinements and expansions and only a few questionable tweaks or misguided deviations. Told in flashback (with several flashbacks within that flashback), we meet a younger, less impulsive Bilbo Baggins (Martin Freeman), the once and future ring-bearer played in his old age by Ian Holm. Coaxed by Gandalf the Grey (Ian McKellen) into joining thirteen dwarves on a quest to reclaim their kingdom and stockpiles of gold from a vile dragon named Smaug, Bilbo reluctantly embarks on an adventure that takes him from the safety of Hobbiton to the troll and orc-ridden wild, the Elven city of Rivendell, the depths of the Misty Mountains and beyond. Drawing from the original book, Tolkien's Appendices and co-writers Fran Walsh, Philippa Boyens and Guillermo del Toro's ever-evolving screenplay, Jackson's Unexpected Journey presents Bilbo as an adventurer-in-the-making in a coming-of-late-age tale, dwarf prince-turned-king Thorin Oakenshield (Richard Armitage) as a fallen hero, the unruly dwarves as nomads longing for a rightful place to lay their heads (rather than mere treasure), their quest a more honorable journey, and Gandalf's frequent absences a means to a far greater end: a response to the rise of a sinister Necromancer (Benedict Cumberbatch) in the stronghold of Dul Guldur. As with The Lord of the Rings trilogy, Jackson, Walsh and Boyens focus first and foremost on character and story, placing the utmost value on casting, performances and the ensuing adaptation above all else. Freeman isn't an A-lister (or rather wasn't before The Hobbit) but his turn as Bilbo establishes him as the film's greatest casting coup. With Freeman, Bilbo is a fully realized anchor point and unmistakably human for a hobbit. The scene in which he awakes to an empty house -- initially relieved and then, all at once, saddened by the silence -- is one of the best acted beats in Jackson's thus far four-film Middle-Earth saga, and makes everything that follows more convincing and compelling than it would otherwise be. It's these moments, these small amendments not present in the original novel but used to terrific effect in the film, that highlight the balance between performance power and adaptative craft the filmmakers make a habit of employing again and again and again. And it's these moments that carry An Unexpected Journey through less satisfying scenes that rely a bit too heavily on CG and heightened action (the escape from Goblin Town and the Rock Giant run come to mind). The rest of the ensemble is too talented for one film. (Thank God there'll be three.) McKellen is Gandalf the Grey, and makes a number of interesting choices, from his perfectly rounded affection for Bilbo to his slight irritation at the hobbit's hesitance to strike out with the dwarves. McKellen is also responsible for yet another subtly emotional series exchange, this time with Blanchett, in a tender, easily overlooked moment of intimacy that never fails to send chills racing up my arms, even after this, my fifth viewing. Armitage is excellent too, even though Thorin's disdain for Bilbo is given the spotlight one time too many. With an iron gaze and a coalfire in his chest, he helps Jackson accomplish a dramatic trifecta: infusing the film with an undercurrent of tragedy, giving Bilbo a reason to sacrifice his all for the dwarves and providing the first film with a captivating conflict all its own. The rest of the dwarvish actors, particularly McTavish and Nesbitt, fill out the company nicely and, more importantly, serve Thorin and Bilbo's arcs selflessly. And Serkis? Freeman and Serkis' Riddles in the Dark sequence is engrossing, not just as a through-thread to Lord of the Rings but as a brilliantly staged and shot rendition of one of the book's most iconic encounters. All told, the cast is a true ensemble in every sense of the word. Jackson may not have filled the ranks with more familiar Hollywood faces, but what he nets in return is on-screen comradery, obvious even between Journey's mortal enemies. If The Hobbit stumbles on its Unexpected Journey, it's not in expanding the tale or the characters, it's in expanding the action and, to a lesser degree, embellishing the visual effects. Tolkien opposed his books being turned into action-oriented spectacles and the last act of The Hobbit, more so even than The Return of the King (which all but required such spectacle), is puffed up and a tad bloated, with whirling swords, a chase scene that goes on a full minute too long, a mountain-pass giant fight that borders on ludicrous (not the fight but the fact that the dwarves end up standing on one of the giants' legs) and a burning treetop showdown that's intense but pure screenwriters' prerogative. None of it kills the film, but it does knock it down a notch, at least in terms of storytelling. Visually, it's immaculate, packed with cutting-edge WETA effects, incredible motion captured creatures and, of course, Gollum, who couldn't look more real. Thankfully, Jackson doesn't turn to computers for every challenge. Middle-Earth is still New Zealand and the practical effects team's masterfully forged props, sets and production design in all their natural and hand-crafted glory; enhanced with CG as needed, sure, but rarely created wholesale in a computer. More to the point, everyone on the production team -- from the costume designers to the armor makers to the weapon masters to the prosthetics masters -- is an integral player in the ensemble, as much as the actors. Like The Lord of the Rings films, The Hobbit: An Unexpected Journey is a melting pot of gracious, self-sacrificing talent both in front and behind the camera. The long and short of it? Even when The Hobbit can't quite carry the Ring, it can carry you. As before, the video presentation wows, dazzles and thoroughly impresses with an encode that stays true to Jackson and cinematographer Andrew Lesnie's every intention. Lush, lovely Shire greens, summer-kissed browns and oranges, moonlit blues pierced by blazing flame, relatively lifelike fleshtones and cavernous blacks grant the image soul and spirit, while impeccable contrast leveling and exceedingly natural shadow delineation give the image depth and strength. The filmmakers' at-times stylized color grading is presented without apparent flaw, and detail is nothing short of extraordinary. Edge definition is crisp and clean, without any significant ringing or aliasing. Fine textures are refined and exceptionally well-resolved. And there isn't a shot or scene marked by anything less than the utmost care. Better still, macroblocking, banding and other issues are absent, and only the slightest hint of noise and negligible crush will give eagle-eyed videophiles pause. The new cut of An Unexpected Journey delivers the first of what promises to be a trio of top tier Extended Edition transfers and doesn't disappoint in the least. Like the theatrical version of An Unexpected Journey, the Extended Edition boasts a bellowing beast of a DTS-HD Master Audio 7.1 surround track. There's just one -- I'd say minor, some would say major -- difference. Bass enthusiasts will notice a small, perhaps negligible boost in LFE oomph that will most likely satisfy those who were disappointed with the March 2013 Blu-ray's low-end output. In the interest of full disclosure, I didn't notice anything amiss earlier this year when reviewing the theatrical cut, although I also should probably admit the issue didn't bother me even once I verified its presence with subsequent viewings. Similarly, I had a hard time picking out the differences here, so take that as you will, bearing in mind the power of placebo as it applies to all parties involved. (None of that, though, is meant to dismiss the concerns of those who were bothered by the theatrical track's bass. Quite the contrary.) The LFE channel once again struck me as forceful yet discerning, producing deep, resonant thooms and weighty booms. All the while, the rear speakers bustle and bristle with engaging, wonderfully effective activity seasoned with convincing directional effects and transparent cross-channel pans. The resulting soundfield is wholly immersive, dropping the listener into the heart of Erebor, the cozy hobbit holes of Hobbiton, the vast expanse of the wild, the midst of a thunderous rock giant battle, the chaos of an underground Goblin city and the center of a cave where a certain magic ring slips from its master's pocket and bounces along the ground. Dialogue remains crystal clear and intelligible throughout as well (without a lost or muffled line to be found), prioritization is flawless, and Howard Shore's score is sweeping and full, just as it should be. It would take quite a lot to top this one as one of the best AV presentations of the year. Audio Commentary: Filmmaker Peter Jackson and co-writer Philippa Boyens deliver an extensive and engaging commentary for The Hobbit: An Unexpected Journey, charting its long development, the many challenges the production faced before the cast even assembled, and as many details about the shoot as the pair could feasibly squeeze into a three-hour discussion. The only downside here I suppose is that there's just one commentary. The Extended Edition release of The Lord of the Rings includes four separate tracks for each film in the trilogy, making Jackson and Boyens' Unexpected Journey commentary seem a bit too lonely. It's a small quibble, but a chat with the dwarves, Freeman and McKellan, or further members of the cast and crew would have been a boon. It's hardly reason enough to penalize the set, though, as the additional two discs of HD bonus content more than make up for any disappointment on the feature film disc. New Zealand: Home to Middle-Earth (HD, 6:53): Jackson and his team tour the lush, always stunning New Zealand countryside, revealing the locations used to bring The Hobbit's Middle-Earth locales to life. Note: this is the same short featurette that appeared on the standard Blu-ray edition earlier this year. The set does not, however, include the 127-minute, ten-part Video Blog series, which is exclusive to the March 2013 2D and 3D releases of the film's theatrical cut. Introduction by Peter Jackson (HD, 1:54): Jackson welcomes fans to the Appendices, and even offers the briefest of brief glimpses at some of the behind-the-scenes material we can expect from the eventual Extended Edition release of The Desolation of Smaug, presumably due this time next year. The Journey Back to Middle-Earth (HD, 48:19): The lengthiest of the Part 7 documentaries and featurettes focuses on the film's seemingly unending, then suddenly time-crunched pre-production, cast prep and Dwarf boot camp, and readying Jackson's Middle-Earth locales, costumes, prosthetics and practical effects for the shoot itself. Riddles in the Dark (HD, 17:00): Jackson, Freeman and Serkis stage the iconic "Riddles in the Dark" sequence as if it were a one-act play, all as the team works to make Serkis' final appearance as Gollum as memorable as the scene itself. An Unexpected Party (HD 25:28): Newly devised motion capture methodology and tricks of the size-and-scaling trade make for a challenging return to Middle-Earth as Jackson and company film the dwarves' visit to Bag End. Roast Mutton (HD, 17:12): Jackson throws a wrench in the troll scene's set design, asking the crew to all but start from scratch at the last minute. From there, three of the Dwarves don motion capture suits to portray the trolls themselves. Bastion of the Greenwood (HD, 10:41): Sylvester McCoy and stunt-double Tim Wong bring Radagast to life before Jackson and the FX team focus on the wizard's animal friends and sleigh-pulling giant rabbits. A Short Rest (HD, 29:12): Ian McKellan, Cate Blanchett and Hugo Weaving return to Rivendell for everything from costume tests to rehearsals to the scripted-on-the-fly filming (all to amusing ends), while Christopher Lee, Ian Holm and Elijah Wood head to London for yet another Lord of the Rings reunion. Over Hill (HD, 13:40): What soon becomes some of the most difficult performance bits and stuntwork of the film comes during the rain-soaked Misty Mountains rock-giant battle and tricky, intricate and potentially dangerous trapdoor plummet into Goblin-town. Under Hill (HD, 19:15): The Goblin King takes the throne courtesy of Barry Humphries as Jackson works to create practical sets, effects and performances that will easily transition into a digital kingdom teeming with hundreds of goblins. Out of the Frying Pan (HD, 16:07): The final battle between Thorin's Dwarves and Azog's orcs in all its fiery, tree-toppling, action-packed pre-FX glory, from conception to stage to fun-filled green-screen shoot. Return to Hobbiton (HD, 18:35): Familiar faces and special guests descend on the Hobbiton sets in Matamata after the filming of an Extended Edition scene in which Gandalf first meets a young Bilbo Baggins at Old Took's party. The Epic of Scene 88 (HD, 8:28): It wasn't just the Dwarves that were running in circles during the Warg chase; everyone involved had to dash from one New Zealand location to the next before the scene could come together. The Battle of Moria (HD, 10:57): The prologue sequence began simply but soon blossomed into an epic of its own to lay the groundwork for the drama and conflict that will come over the course of all three films. Edge of the Wilderland (HD, 22:37): Pick-ups throughout New Zealand cap off The Unexpected Journey shoot, which soon wraps with a cast who began the production as strangers and ended as family. Home is Behind, the World Ahead (HD, 11:40): With principal photography wrapped, the crew dig back through what's been and look ahead at what's to come as Jackson and editor Jabez Olsen settle into the editing bay, watch as the FX comes together, and prep for the first film's premiere. Better still, The Desolation of Smaug begins to come together, offering fans a preview of many sequel scenes and characters that have gone largely unseen before now. The Company of Thorin (HD, 1:02:41): This six-part documentary delves into the five families of Dwarves featured in the film, their relationships and histories, the tone and balance Jackson struck within the company, and the actors' approach to their characters. Segments include "Assembling the Dwarves," "Thorin, Fili & Kili," "Balin & Dwalin," "Oin & Gloin" and "Bifur, Bofur & Bombur." Of particular value is the cast's comments on their performances, which reveal more detail about the warriors than could possibly be attained simply by watching the film. Mr. Baggins: The 14th Member (HD, 16:10): From conceptualization to casting to performance, Martin Freeman is front and center in this rather candid overview of the process behind finding and fully realizing the perfect Bilbo Baggins. Durin's Folk: Creating the Dwarves (HD, 57:25): Concept art and design, costuming, makeup and prosthetics, props, personality, diversity and differentiation; spend a wonderfully exhaustive hour with the concept artists, WETA wizards and talented team members who transformed Tolkien's Dwarves into viable big screen heroes. The People and Denizens of Middle-Earth (HD, 58:09): Moving beyond Bilbo, Thorin and the Dwarves, this next hour-long documentary tackles the beasts, creatures and other colorful characters of An Unexpected Journey, many of which required extensive motion capture, digital performance and visual effects. Segments include "The Stone Trolls," "Radagast the Brown," "Goblins" and "Azog the Defiler." Realms of the Third Age: From Bag End to Goblin Town (HD, 58:59): Yet another must-see, all-encompassing hour of Appendices, this time devoted to the locales of Middle-Earth as seen in An Unexpected Journey. Witness the development, creation and implementation of Hobbiton, Rhosgobel, Rivendell, the Misty Mountains and Goblin Town. The Songs of The Hobbit (HD, 32:32): It isn't often than a film's music is given much attention come its eventual supplemental package, but the first film in The Hobbit trilogy earns just that. Learn how the filmmakers adapted Tolkien's songs for An Unexpected Journey, from "Blunt the Knives" to "Misty Mountains," "The Man in the Moon Stayed Up Too Late," "Goblin Town" and "Song of the Lonely Mountain." No, the extended cut of The Hobbit: An Unexpected Journey isn't as satisfying as the theatrical cut. Several new scenes and shots directly address some of the film's problems, but most of the additions are inessential and actually exacerbate a number of issues (pacing and embellishment among them), making for an enjoyable but ultimately curious alteet is a must-own release. Regardless of how you react to the new cut, its video presentation is outstandingrnate take on the first entry in Jackson's trilogy. Even so, the Extended Edition s, its DTS-HD Master Audio 7.1 surround track is terrific, and its supplemental package is so exhaustive it's almost exhausting to dig through. Jackson and Boyens offer up an excellent commentary, and nine hours of Appendices material explores every last aspect of the production. Frankly, the Appendices discs are worth the cost of admission alone. Now it's simply a matter of patiently waiting for The Desolation of Smaug to descend on theaters this December. Download The Hobbit: An Unexpected Journey (Extended Edition) from the iTunes Store in Digial HD.